Dining out is one of life’s simple pleasures. Sharing a meal with friends and family — a meal you didn’t have to prepare, and that someone else serves to you — can be a happy oasis in an otherwise stressful and difficult day. But many people are mystified by the prospect of dining out while following a ketogenic diet. Faced with menus boasting pasta and rice specialties or entrees that are invariably accompanied by starchy side dishes, they’re uncertain of what they can order and may even feel like there’s nothing safe to choose. Dining out on a ketogenic diet is much easier than you might think. It isn’t difficult; it’s just different. Dining out while watching your carb intake isn’t hard at all. In fact, in some ways, it’s easier. If you’re overwhelmed by restaurant menus that are ten pages long and offer every food under the sun, it’s actually simpler to decide on something if a significant portion of the menu — pasta, risotto, sandwiches, pancakes, noodles — is off limits. Provided you’re careful about what you order, you can absolutely enjoy dining out on a carbohydrate restricted diet. The trick is to be proactive about customizing your order and asking for appropriate substitutions. With food allergies on the rise and more people becoming health-conscious, restaurant staff are not put off or surprised by special requests. They are quite familiar with the modifications you’ll ask for, and servers will not look at you funny if you ask them not to bring the bread basket. When traveling, people who are new to keto sometimes post to social media asking locals for recommendations for keto-friendly restaurants in the area. The truth is, every restaurant is friendly to low-carb eating provided you know how to customize your order. Some establishments may be easier to navigate on a carbohydrate restricted diet, but it’s unlikely you’ll find yourself in a place where there’s literally nothing suitable for you. 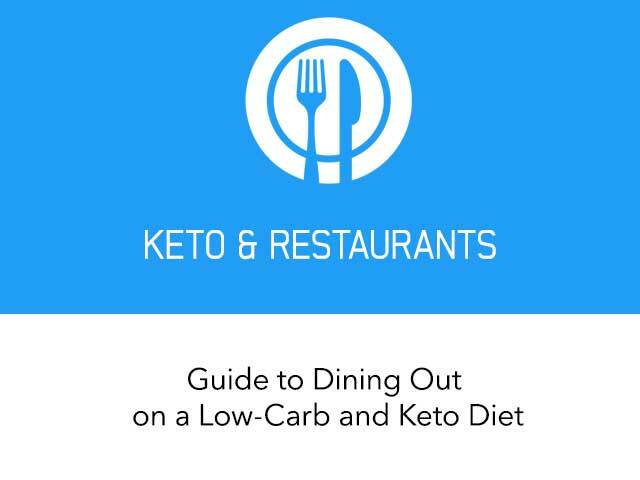 Here’s a guide to selecting appropriate foods that will allow you to enjoy a meal out while continuing to reap the benefits of your ketogenic diet. Choose dishes that are prepared simply, without sauces. Sauces often have hidden (and not-so-hidden) sugars and starches. Opt for grilled, baked, steamed, or roasted meats, poultry, seafood, non-starchy vegetables, or salads. Fried foods are not off limits, but it may be best to avoid them because they typically have grain-based breading or batter. Plus, while fat certainly isn’t something to be feared on a ketogenic diet, you do want to be careful about the kinds of fat you consume, and many restaurants use mixtures of vegetable oils, which are high in pro-inflammatory omega-6 fatty acids and should not be used for cooking. At restaurants where free bread or rolls are provided before the food is served, request that the wait staff not bring those to the table. (This works if everyone at the table is watching carbs. If others in your party want the bread, you’ll simply have to abstain.) Ask for something else if it’s the type of restaurant that is likely to have something available; olives or pickles can be served instead of starches and grains. Ask for a double portion of non-starchy vegetables in lieu of a starchy side dish. (For example, a double serving of broccoli instead of a potato, or roasted vegetables instead of pasta or rice.) Most entrees come with a choice of one or two side dishes, and there’s usually a selection of starchy items and non-starchy vegetables. Double up on the lower carb options. 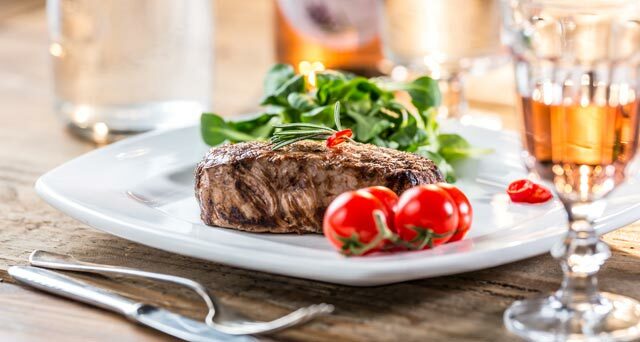 If you’re following a strict ketogenic diet, as opposed to a more general low carb diet, you may need a bit more fat than your dish contains. If so, simply request some extra olive oil or butter on the side. Prepare ahead of time. Many restaurants have their menus posted online. 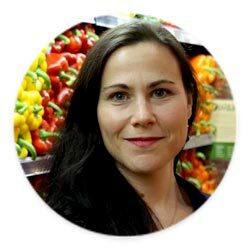 Take a look ahead of time so you’ll have an easier time ordering, or so you can suggest a change of location if you feel your options would truly be too limited to order something keto-friendly. Fajitas are perfect for keto! Grilled meat, peppers and onions—it doesn’t get much better than that. Ask the server not to bring the tortillas, and request extra vegetables instead of rice and beans. You can enjoy sour cream, cheese, guacamole, and salsa as condiments. (Make sure the salsa is mostly tomatoes, onions, and chilies, and isn’t a heavier carb variety with corn, mango, or black beans, for example). At popular Mexican fast-food chains, you can order meat, cheese, and vegetables in a lettuce bowl instead of a flour wrap. Choose kebabs or other grilled meat dishes. Ask for extra vegetables or meat instead of rice. Avoid hummus and pita bread, stuffed grape leaves (which usually contain rice), and anything else with beans or high starch. 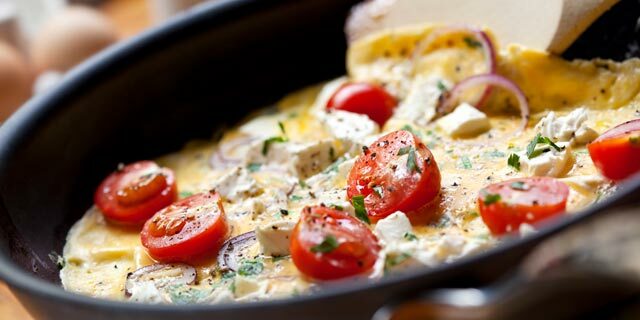 These cuisines are famous for grilled meat specialties; take advantage of that, as well as marinated feta cheese, olives, seared halloumi cheese, and tzatziki or other yogurt sauces. These are somewhat similar to the Middle Eastern cuisines discussed above. Avoid rice, pita, and naan. Favor curries and dishes of grilled or roasted meat and vegetables; avoid chickpeas and potatoes. Some Indian restaurants are vegetarian. 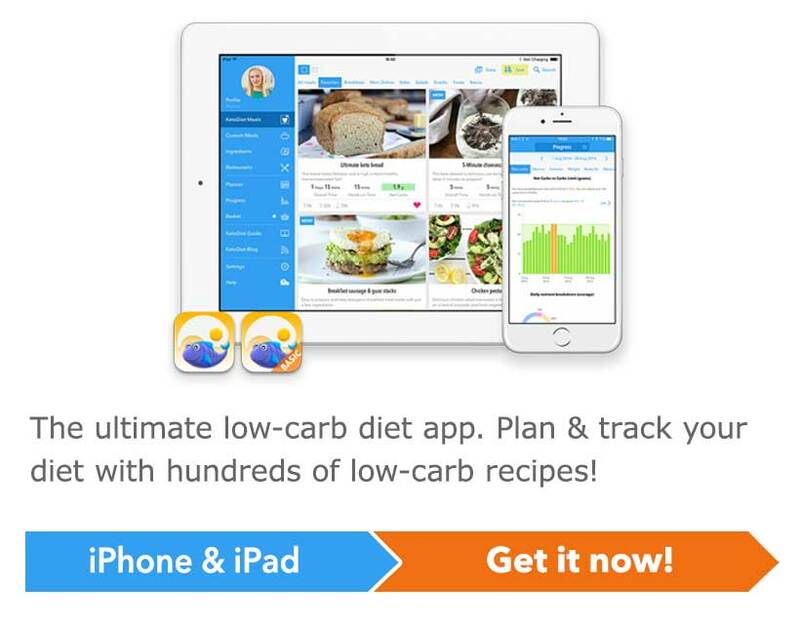 It may be more difficult to make low carb choices in this case, since there will likely be more beans, potatoes, and other starches. No General Tso’s? No problem! Request that your dishes be prepared steamed or cooked without sauce. Sauces often contain sugar and corn starch, so instead, use soy sauce, wasabi, or hot mustard as condiments. Great choices for Chinese takeout are steamed chicken or shrimp with mixed vegetables. Some restaurants also offer grilled chicken on skewers or beef on skewers. Avoid rice, noodles, wontons, dumplings, deep-fried foods, and tempura (due to the batter). 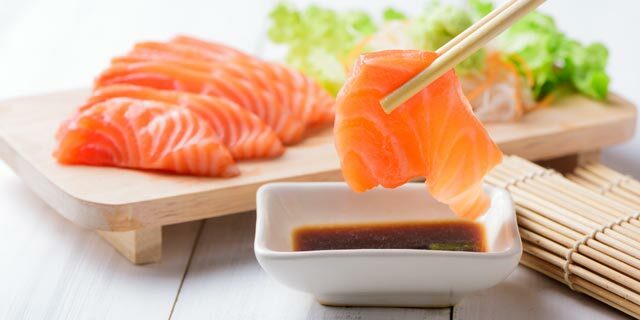 Sashimi is an excellent choice; just avoid sushi rice. For Thai restaurants, avoid noodle and rice dishes. Choose curries that contain meat or seafood and vegetables, spices, and coconut milk. Ask your server if the curries are thickened with flour or corn starch; they may be able to leave them out. Pasta is obviously off limits, but most Italian restaurants have plenty of other options that are suitable for low carb diets. Choose salads, steaks, chicken, pork chops, or seafood with vegetables. Avoid bread and breadsticks and ask for no croutons if you order a salad. Request extra non-starchy vegetables instead of pasta, potatoes, or polenta as side dishes. These establishments usually have diverse menus, so finding suitable options is easy. Just use the same logic as for anywhere else: no grains or other starchy carbs, and no sweets for dessert. Caesar, chef, or cobb salads are fantastic choices, as are bunless hamburgers or sandwiches. As always, ask for non-starchy vegetables instead of fries or other starchy sides. You can often substitute a house salad for a carb-heavy side dish. Other good selections include any type of roasted meat, chicken, or fish, or a platter of egg, tuna salad, or chicken salad on beds of lettuce. Stick with eggs, bacon, ham, and sausages. Avoid pancakes, waffles, potatoes, toast, bagels, muffins, fruit, juice, jam/jelly, etc. Omelets containing meat, cheese, and/or low-carb vegetables are a great way to go. (Think ham, onion, peppers, spinach, mushrooms, zucchini, greens). Any other egg preparations are fine, too: poached, scrambled, over-easy, hard-boiled — however you prefer them. Avoid bottled ketchup, which contains high-fructose corn syrup. Use mustard, mayonnaise, or hot sauce as condiments. Orange juice or fruit smoothies no; coffee or tea, yes. Customize your salad as necessary: no dried cranberries, fruit, crunchy noodles, etc. Stick with lettuce, spinach, and other greens. Suitable additions include chopped hard-boiled egg, bacon, cheese, avocado, ham, turkey, chicken, steak, salmon, olives, cucumbers, sliced peppers, radishes, and other non-starchy vegetables. Use oil & vinegar or a high-fat dressing, such as ranch or blue cheese. 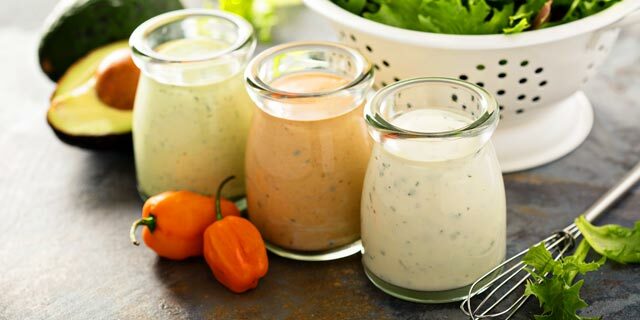 Avoid thousand island, French, honey mustard, raspberry vinaigrette, and other high-sugar dressings. If there’s a sauce with ingredients you’re not sure of, ask the server to tell you what’s in it. Many sauces contain sugar, corn syrup, corn starch, and/or flour. For this reason it’s best to stay with simply prepared dishes — grilled, broiled, or steamed meats or seafood with no sauce. As mentioned above, ketchup is loaded with HFCS, and many salad dressings are high in sugar and corn syrup. Your safest bets for condiments are mustard (all are fine except honey mustard), mayonnaise, hot sauce, melted butter, olive oil, or vinegar. (All vinegars are fine, but go easy with balsamic as it’s higher in carbs than the others.) Full-fat, low carbohydrate salad dressings are permitted — look at labels in supermarkets to get an idea of which types are best. The carb count per 2 tablespoon serving should be 2 grams or less. 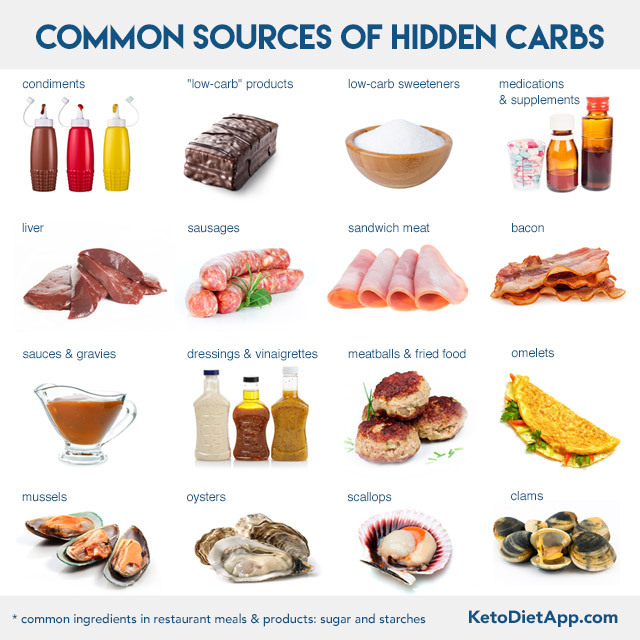 For more information on hidden carbs in common low-carb and keto foods: 7 Surprising Sources of Hidden Carbs. The same rules apply to beverages as apply to food: avoid the obvious sources of sugar and other carbs, and stick with options you know are suitable for you. Still or carbonated water is always a safe choice, as is coffee or tea. You may opt for diet soda if artificial sweeteners (or natural low-carb sweeteners like stevia) are part of your diet. 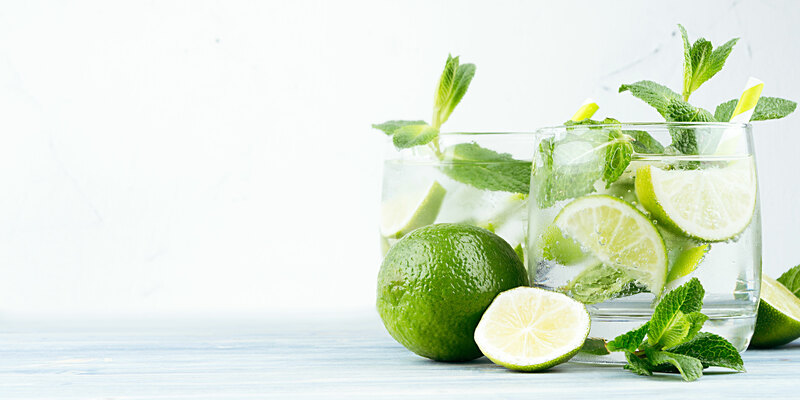 Don’t underestimate the power of fresh-squeezed lemon or lime to jazz up water or club soda. As for alcohol, you might be surprised that distilled spirits are nearly carb-free, and most wines are relatively low in carbs. Alcohol tolerance typically decreases in people following low-carb and ketogenic diets — the effects will hit you more rapidly and more strongly than you may be accustomed to, so go slowly and don’t imbibe on an empty stomach. Here&apos;s a helpful guide to alcohol on carbohydrate restricted diets. The suggestions above are intended for people following low-carb or ketogenic diets primarily for weight management or overall health. If you are following a more restrictive diet due to an autoimmune condition or you have severe intolerances to gluten, soy, dairy, or some other dietary element, you will need to be a bit more careful. If you absolutely must avoid certain ingredients, I recommend getting familiar with a select few restaurants in your local area that you trust to prevent cross-contamination and whose staff is well-versed in taking special measures to ensure your food is prepared to your specifications. It might help support your case if you assure them that if they’re able to accommodate your unique needs, you will be happy to patronize their establishment frequently, and recommend that others do so, too. Even before the age of social media and online reviews, word-of-mouth recommendations from satisfied customers were a restaurant’s best advertisement. Things might be a little different if you have preferences based in environmental or ethical concerns, or if you prefer to avoid certain ingredients on principle (e.g., soybean or corn oil, feedlot meats, farmed fish). If you prefer to consume exclusively organic produce, grass-fed or pastured meats, poultry, and eggs, there may be restaurants in your local area that can accommodate this, or at least come close. If you have a severe allergy or sensitivity to specific ingredients, then obviously you need to avoid those completely. But if you choose to eat a certain way out of personal preference, keep in mind that socializing with friends and family and enjoying the simple pleasure of a shared meal is one of the things that keeps us human. Loneliness and isolation have substantial negative impacts on health. So it may be worthwhile — on occasion — to bend your personal rules for the sake of company, conversation, and tending to aspects of your health beyond what you eat. 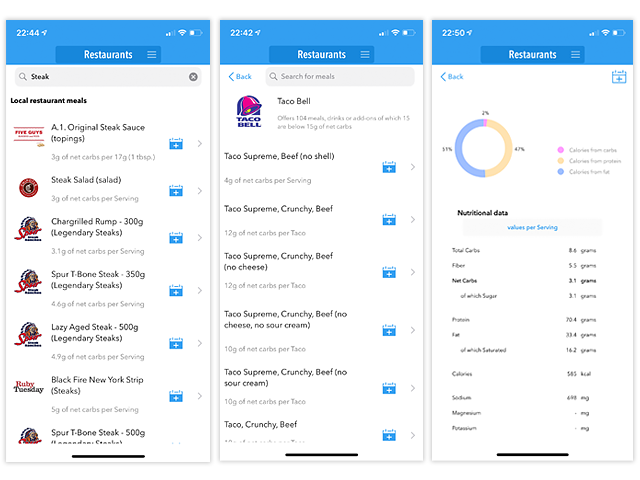 To help you make the right choices while eating out, get the KetoDiet App and browse through thousands of keto-friendly meals in hundreds of restaurant chains. Track your carbs, protein, fat and calories while eating out. New restaurants are added in every update! 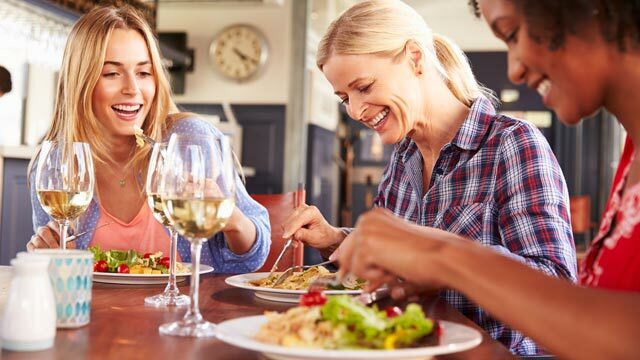 If you follow these tips, you’ll find that dining out while sticking to low carb or keto is not difficult at all, and you’ll wonder why you ever worried about it. Armed with these simple strategies, you will never find yourself at a restaurant and think there is truly nothing suitable for you. When ordering the replacement lowcarb veggies as a side item, I will often add a high fat sauce, like alfredo if available, to my order and ask them to cover it. Often I'll order a Pasta Primavera (basically noodles with vegetables and a ton of alfredo sauce) and replace the noodles with broccoli. Easy! That sounds like a great keto option!